Info "Aim the sun's rays on the plant to make it bloom." Green Thumb is one of Orbulon's microgames in WarioWare: Twisted! 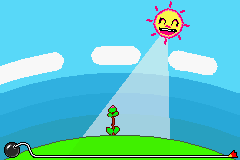 The purpose of the game is to tilt the Game Boy Advance to move the sun's light through the clouds and into the flower until it blooms. 1st level difficulty: The clouds are stationary. 2nd level difficulty: The clouds now move. 3rd level difficulty: The clouds still move and some are longer.